There are some places I keep going back to because I am so comfortable there. There are some places I feel so comfortable in that you would have to peel me out of them if I spent too long there. In some of those places I feel I am at home, even though I do not live there at present; in others there are happy memories of how I have been shaped in my values and my personality. I find myself going back to these places time and again. And usually it is about the places themselves rather than where I am staying. Usually, the destination is the point, and the journey adds to the excitement. Sometimes, there are hotels that are worth staying in just for themselves. Hotels can never be homes, and I would never fool myself into thinking that any hotel could be home. 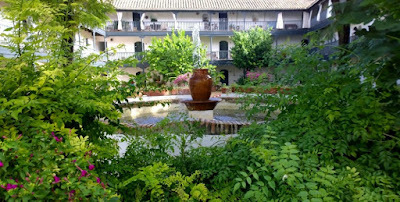 But then I am reminded when I watch Fawlty Towers, The Best Exotic Marigold Hotel and similar series that there was a time when hotels were natural places for people to retire to. There are hotels that I would return to time and again just because of their location. They include the Ferrycarrig at the mouth of the Slaney in Wexford, Pepi Boutique Hotel on Tsouderon street, Rethymnon, in Crete, the Hedgehog Vintage Inn in Lichfield, and the Varvaras Diamond Hotel in Platanes near Rethymnon. But if they were not there, I would still keep returning to Lichfield, Wexford and Rethymnon. 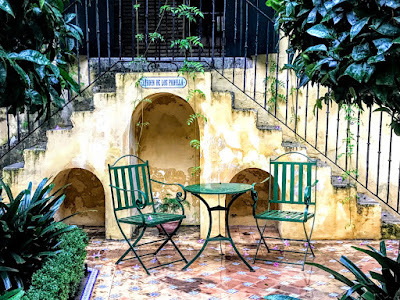 However, last week I stayed in the most wonderful hotel in Seville. 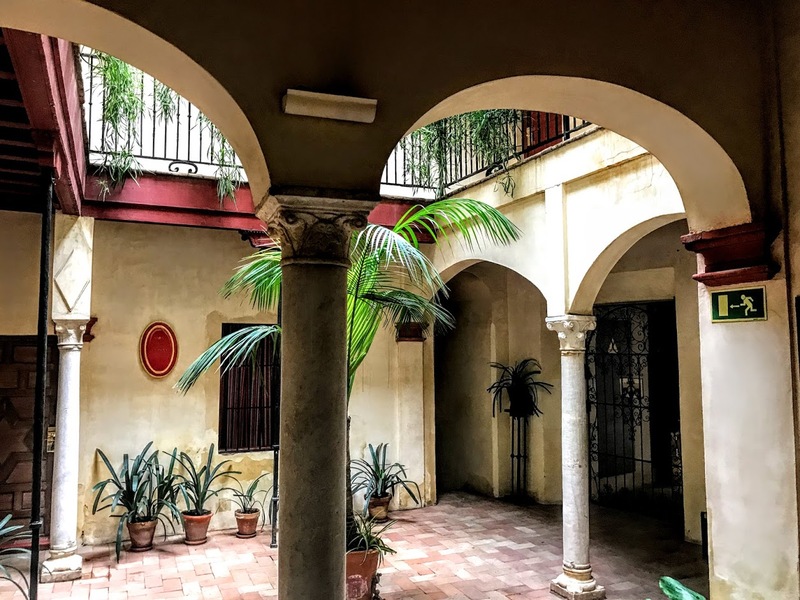 Las Casas de la Judería is in the historical centre of Seville, beside the Church of Santa Maria la Blanca and across the street from a range of tapas bars, cafés and restaurant, and part of the city’s old Jewish Quarter, on the edge of the Barrio Santa Cruz. Here it was a ten-minute walk from Alcazar, Seville Cathedral and the Giralda Tower and it is just another five minutes to the Torre del Oro, the University and the banks of the River Guadalquivir. 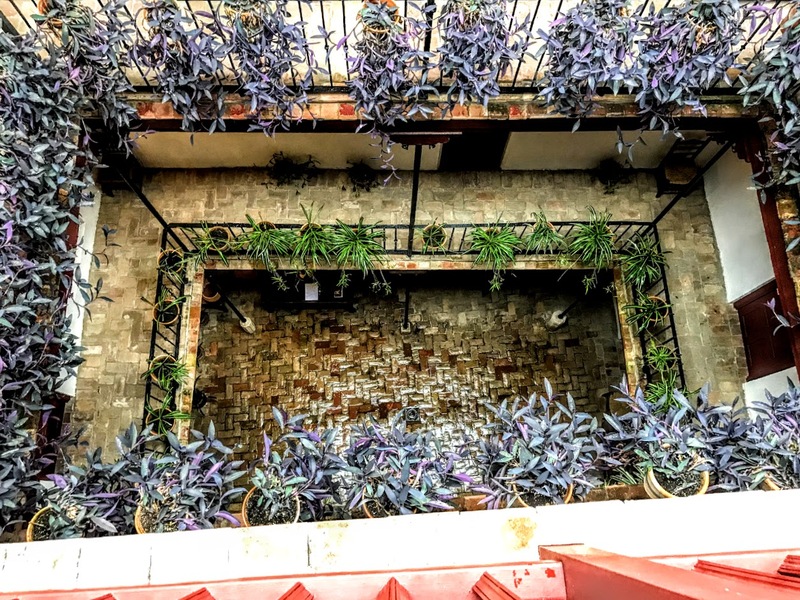 Inside, the hotel is paradise of its own making, another world away from the city. This is a collection of 27 different 15th century traditional houses. They appear to have been assembled randomly, but they have been restored to reflect the atmosphere of the surrounding neighbourhood. 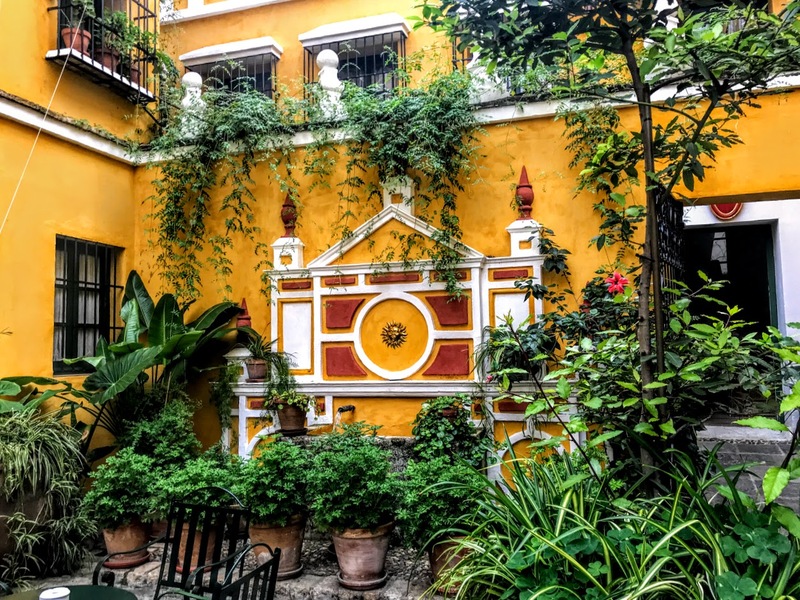 There are baroque influences, and rustic charms in this self-contained barrio with a variety of buildings, courtyards, alleyways, overhanging balconies, gardens and terraces. The 40 patios are typical Andalusian courtyards and ooze with vibrant colour, with hanging baskets, fountains, frescoes and classical features. 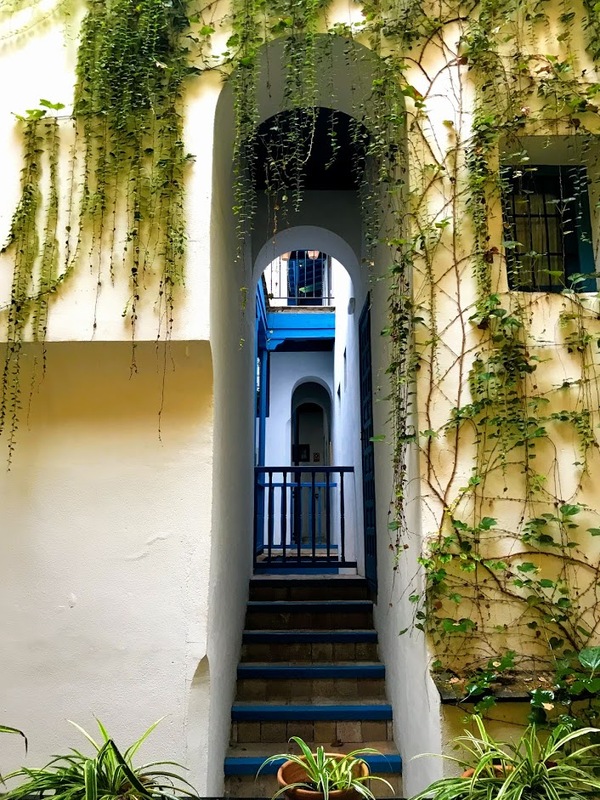 We moved through the hotel, from one courtyard to the next, one garden to the next, through a lair of labyrinthine tunnels, steps and arched passageways, often to the sound of water dripping from a tap or fountain that was heard but not seen. 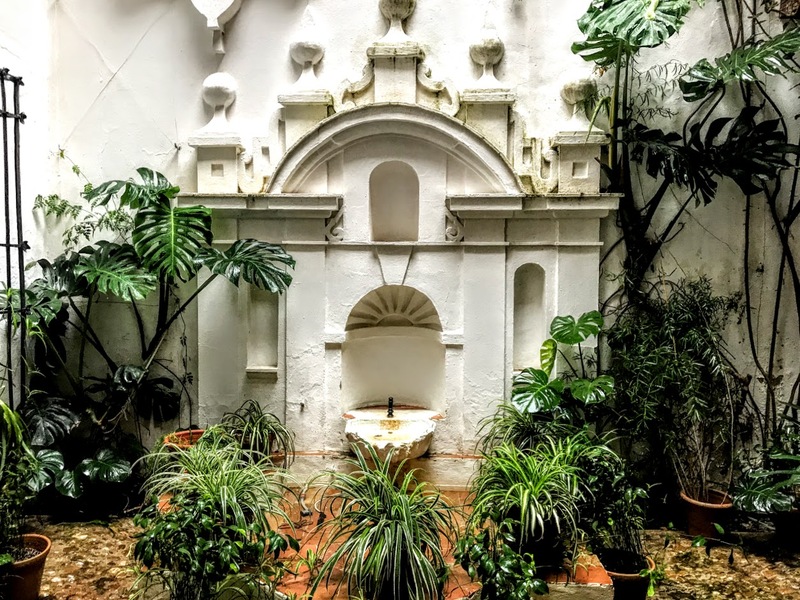 There are surprises everywhere in these courtyard and tunnels. Fountains, statues and Roman amphoras decorate the winding passageways linking the rooms and shared open spaces. 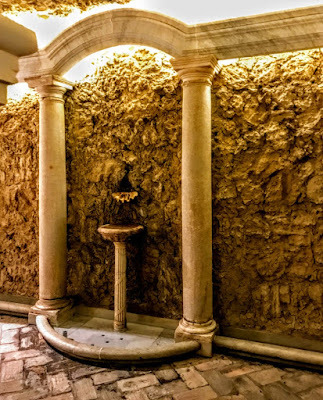 A Roman tunnel connects the rooms with the breakfast room and spas. 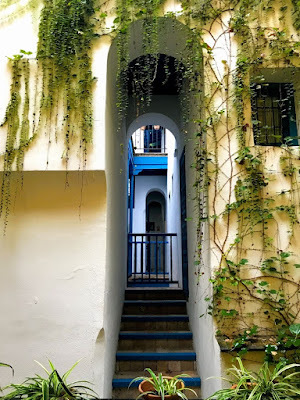 At times, we criss-crossed the narrow streets and alleyways of Seville itself, yet still found ourselves in the hotel. 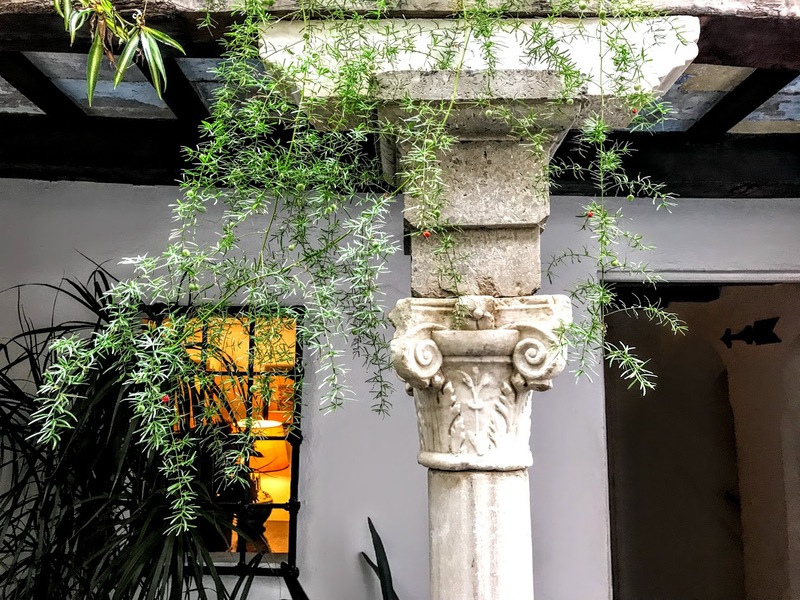 The hotel has 178 rooms, individually designed and decorated, each with its own unique touch, filled with history and character, and facing into beautiful cool courtyards filled with plants. Some of the rooms have names that are reminders of the people said to have lived in these houses down through the centuries: Duke of Bejar, Count of Villamanrique, Casa del Cura … one room is even named after Christopher Columbus, who is buried in Seville Cathedral. Some of the names are a reminder that this was the heart of the Jewish Quarter before the Inquisition … Casa de Mose Bahari … or an intricate Star of David interlaced in the woodwork of a door. 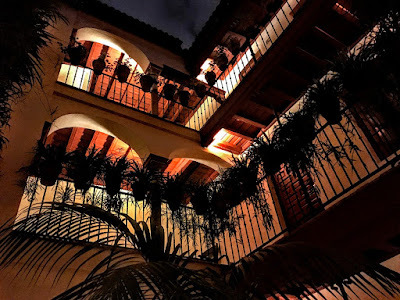 The Palace of the Zúñigas once belonged to the Zuñiga family and is now the site of the hotel reception and the piano bar, which is named the Marquis of Villamanrique Saloon. 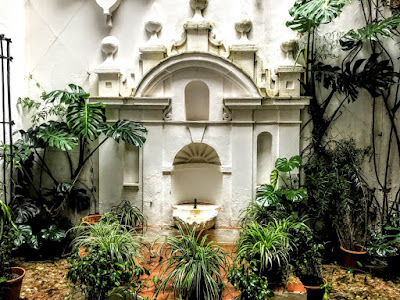 The Padilla family once owned the area that serves as the porter’s office, and they give their name to the Palace, Garden and Small Patio of the Padillas. We were too late in the year to use the rooftop swimming pool, which is open from May to September, and has views cross the city. 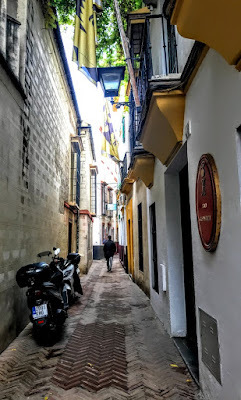 There are so many cafés and tapas bars on the doorstep we never ate in the hotel. But on Friday evening, on our last night, we enjoyed a glass of wine and the live music in the piano-bar. Of course, if this hotel was not there, I would still want to return to Seville. 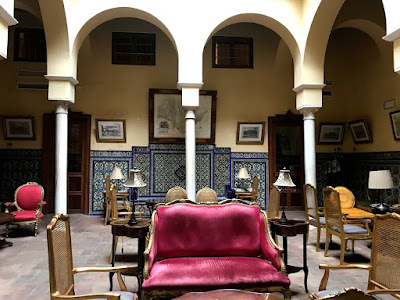 But if there was no Seville, and this hotel was in the middle of nowhere, I would still want to return to Las Casas de la Judería. 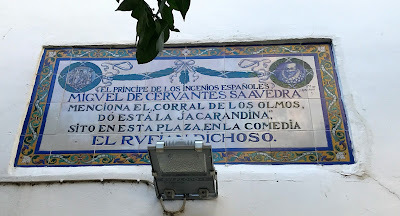 During my visit to Seville last week, I went in search of the places in both Seville and Tarifa that were associated with the extraordinary life of Josefina de Comerford, who was involved in Spanish political intrigues in the early 19th century. She was given the title of Condesa de Sales and is the one figure in the history of the Comerford family who stands out as a femme fatale. In recent years, Josefina has become the subject of Spanish biographical studies, but even before her death she inspired romantic semi-fictional biographies. To this day, her legacy has divided Spanish historians, who have seen her as a fanatic, an extremist, a romantic heroine, or an early feminist. 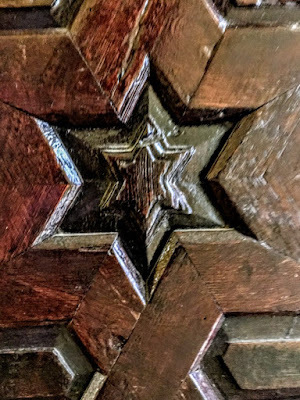 Her great-grandfather, Major-General John Comerford (ca 1665-1725), also known as Don John de Comerford, was born in Finlough in Loughkeen, Co Tipperary, and was a member of one of the Callan branches of the Comerford family in Co Kilkenny. He was sworn a freeman of the City of Waterford on 23 August 1686, and during the Jacobite Wars he was an ensign in the Jacobite Bagnall’s Regiment of Foot alongside his brother, Henry Comerford. By 1709, John Comerford was the colonel of the Regiment de Waterford in the Spanish army. Later, he was promoted to the rank of Major-General and knighted by the King of Spain. He died in Badajoz, 200 km north of Seville, close to the Portuguese border, on 18 May 1725. His widow, Henrietta O’Neill, died in Madrid in 1747. Her first husband was another Irish exile in Spain, Colonel Henry O’Beirne, an Irish colonel in the Spanish army. Henrietta Comerford and her first husband were the parents of Maria Therese O’Beirne (died 1777), Maid of Honour to the Queen of Spain. In 1726, she married the attainted Philip Wharton (1698-1731), 2nd Duke of Wharton. 1, Joseph John Comerford (1719-post 1777), also known as Don Joseph de Comerford. Joseph John Comerford (1719-post 1777), also known as Don Joseph de Comerford. He was born in 1719 in Barcelona. He was a Knight of the Order of Calatranta and was living in 1744. He married Maria Magdalena de Sales, Madame de Sales, a widow sometimes described as Marquesa de Sales. Doña Maria Magdalena de Sales, Marquesa de Sales, was a native of Annecy in the Duchy of Savoy, and a member of the same family as Saint Francis de Sales, Bishop of Geneva. Don Joseph de Comerford was still living in 1777 when his half-sister, the Duchess of Wharton, died in London. 1 (Major) Francisco Comerford (ca 1749?-1808). 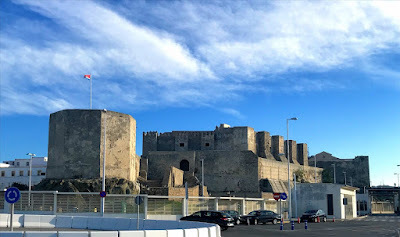 2, Enrique Comerfort, Conde de Bryas. Major Francisco Comerford (ca 1749?-1808) lived much of his life in Cádiz. 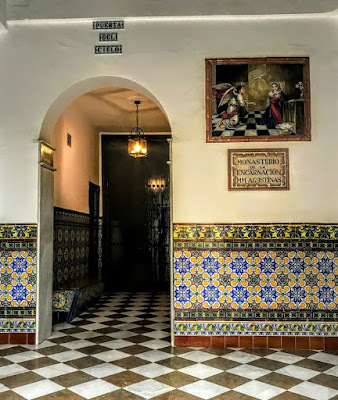 He was a godfather or sponsor at the baptism of Carlos O’Donnell y Anethan, father of Leopoldo O’Donnell y Jorris (1809-1867), the first Duke of Tetuan, and Spanish Minister of War, and grandfather of Carlos O’Donnell y Alvarez de Abreu (1834-1903), the second Duke of Tetuan and Spanish Foreign Minister. He married Maria MacCrohon, and he died in 1808. They were the parents of one daughter: (Doña) Josefa Eugenia Maria Francisca Comerford MacCrohon de Sales (‘Josefina’ de Comerford) (1794-1865). Francisco Comerford’s younger brother, Enrique Comerfort, Conde de Bryas, married a cousin, Juana Francisca de Comerford y Sales. Following the French invasion of Spain, he resigned his army commission and left for Dublin, bringing his 11-year-old orphaned niece and god-daughter Josefina with him. Later, he attended the Congress of Vienna in 1815 and died soon after. His niece, Doña Josefa Eugenia Maria Francisca Comerford MacCrohon de Sales (1794-1865), is known in Spanish history and in popular folklore as Josefina de Comerford. 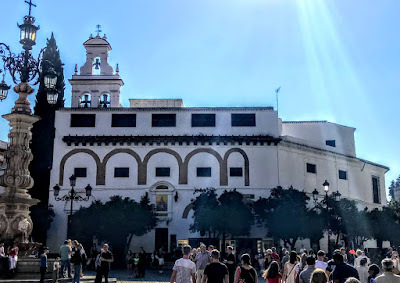 She was born in 1794 in Ceuta, a Spanish outpost in North Africa, and she was baptised on 26 December 1794 in the Church of Nuestra Señora de los Remedios in Ceuta. Her father moved with his regiment in 1798 to the port of Tarifa, on the Straits of Gibraltar and facing Tangiers on the Moroccan coast. 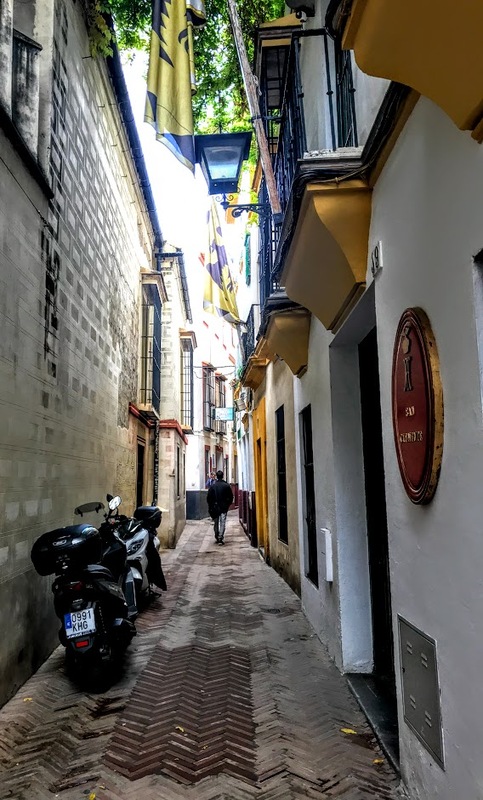 Josefina always said she was born in Tarfia, taking four years off her life, because she liked this legendary city more than Ceuta, which was then little more than a prison. In 1805, Francisco was an eyewitness to the Battle of Trafalgar. When her father died in 1808, Josefina was adopted by her uncle Enrique Comerford, Conde de Bryas, and she moved with him to Dublin, where she appears to have been brought up in luxury and in a wide social circle. She was involved in the capture of Seo de Urgel in Catalonia on 21 June 1822, followed by the proclamation of Ferdinand VII as absolute monarch. For this, the Regency rewarded Josefina with the title of Condesa de Sales or Countess de Sales, derived from her paternal grandmother’s family, a distinction later confirmed by King Fernando VII. At the fall of the constitutional regime in 1824, she moved to Barcelona, where she continued plotting ultra-royalist activities. However, while she was in in Barcelona she was far from the main focus of the rebellion in Cervera, about 100 km west of Barcelona. When the new absolutist movement was set up in 1826, ‘The Trappist’ died as a prisoner in a convent and Josefina was imprisoned in Barcelona. However, Josefina made good her escape from Barcelona and installed herself in Cervera, where she gathered a new ultra-royalist group, with the support of a large number of priests. She denied all the charges against her but was found guilty. Her death sentence was commuted because she was a woman, and she was sentenced to live an enclosed life in exile in the Convento de la Encarnación, on the Plaza Vigen de los Reyes, beside the Cathedral and the Archbishop’s Palace in Seville. 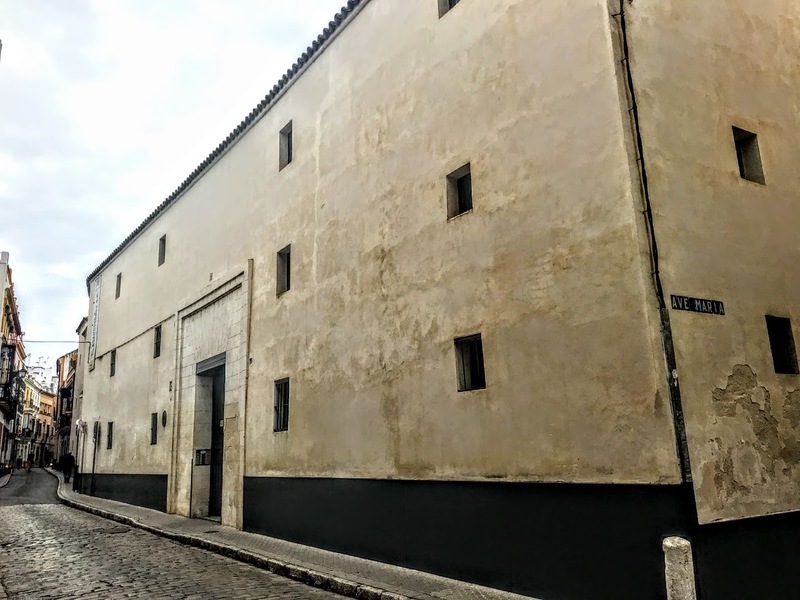 The whitewashed Augustinian convent is a Baroque building dating from 1547. 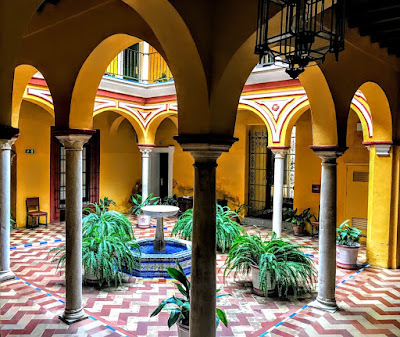 It stands on the site of the 14th century Santa Marta Hospital, founded by Fernán Martínez in 1385. The hospital, in turn, was built on the site of a former mosque. It became a convent in 1591, and is still commonly known as the Convent of Santa Marta. The convent is enclosed and can only be visited in the company of one of the nuns. The cloisters have an arcaded patio that is arcaded, and the walls enclosing the patio have wonderful ceramic tiles and 18th century paintings. The museum of sacred art on the second floor includes sculptures, small altars, 17th and 18th century statues of the Child Jesus and a collection of clothes to dress the statues. The convent faces a square that was once home to the Corral de los Olmos (the Courtyard of the Elms), a rogues’ inn that features in many of the writings of Spain’s literary giant, Miguel de Cervantes (1547-1616). Two plaques on the convent walls are reminders of the links between Cervantes and the convent. Josefina failed in her appeal for a pardon in 1830. But she regained her freedom after the death of Ferdinand VII in 1833, and for the rest of her life she lived a secluded, almost hidden life in the Corral del Conde, a large mansion on Calle Santiago, and only a six-minute walk from Las Casas de Juderia, the hotel where I was staying in the Jewish Quarter of Seville. 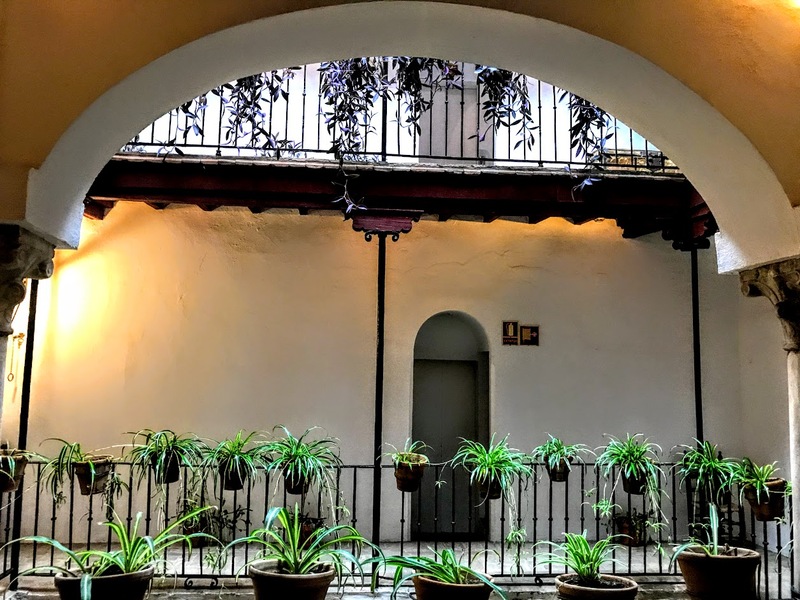 The Corral del Conde (the Count’s Yard) is a typical 16th century Andalusian courtyard, and it is listed as an Historical Cultural Heritage. 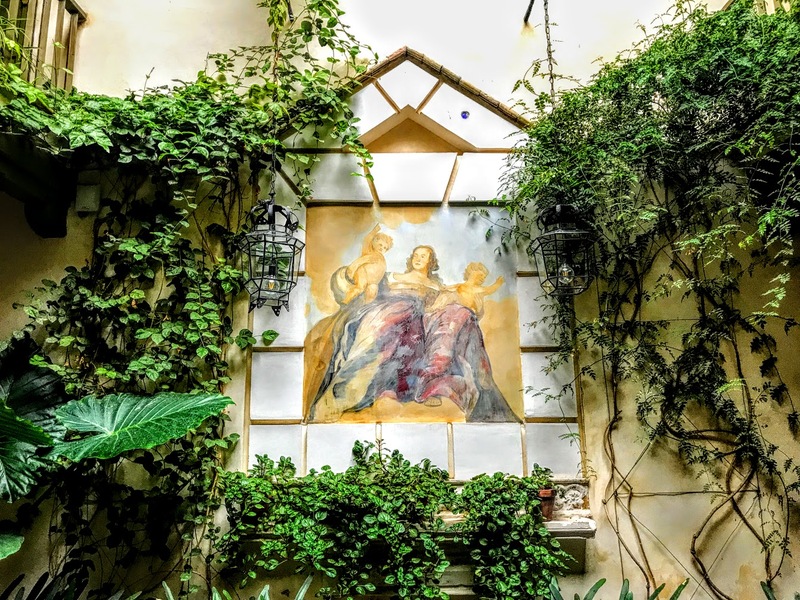 It is plain and stark outside, but inside it retains the charm and traditional features of a mediaeval courtyard, with a central paved patio, wooden galleries, bread oven and even its own chapel. The plants, flowers and fountain create an oasis in the heart of Seville. It was first built when Seville was under Muslim, was rebuilt in the mudejárica style, but its present layout is influenced by the popular architecture of the 18th century. Douglas Fairbanks and his wife Mary Pickford stayed in the Corral del Conde in the spring of 1924, the year The Thief of Baghdad was released. The Corral del Conde was refurbished and restored as an apartment building in 1982-1983. 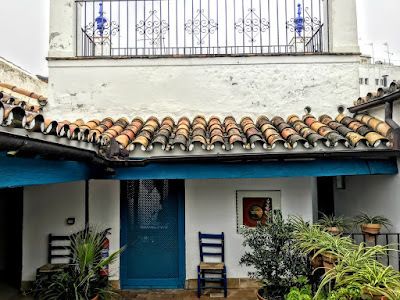 Many of the apartments are rented by artists, students and tourists. Josefina made her will in Seville on 30 December 1863. She died in Seville on 3 April 1865, the Monday before Easter, at 8 Calle Garzo, now renumbered and renamed as 17 Calle García Ramos, in the Parish of San Vicente. She was buried in the Cemetery of San Fernando in grave number 527. The first semi-biographical accounts of her adventurous life were written during her own life by her political opponents, including Agustín Letamendi (1849) and Francisco J Orellana (1856). 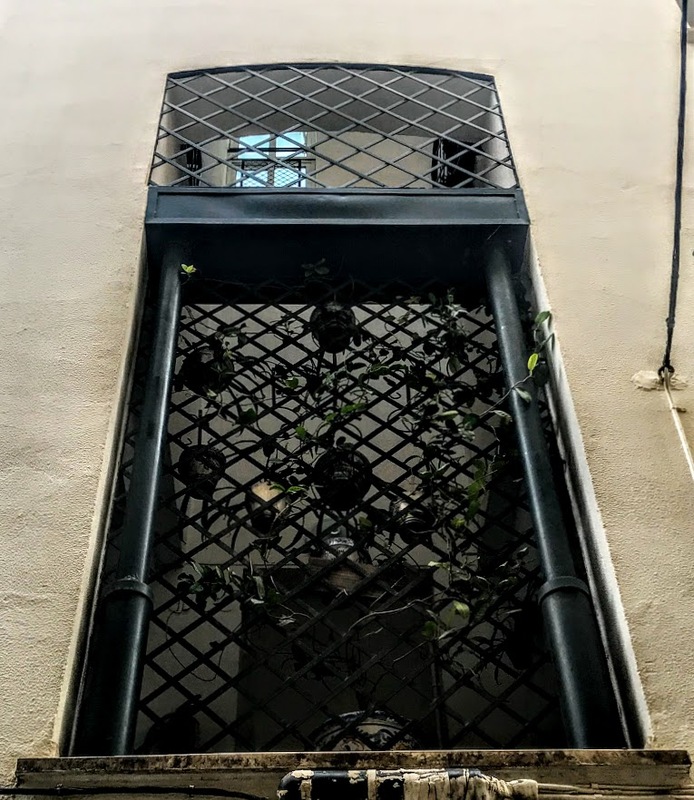 Some of the accounts discredit her by alleging she had an affair with a young gardener in the convent where she was forced to live in Seville. 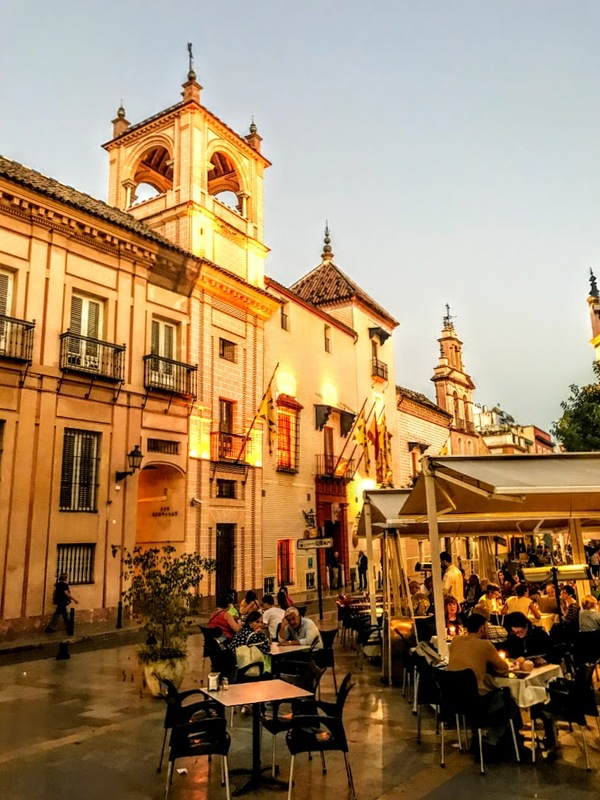 Don Antonio Pirala, the historian of the 19th century civil wars, tried to meet her in Seville in 1853 but was told either she was back in Catalonia or had returned to Ireland to settle family affairs and to recover some of her belongings. Many of the historical accounts of her life are based on the semi-fictional two-volume book by Agustín de Letamendi, Josefina Comerford o el Fanatismo (Josefina Comerford or Fanaticism), published in Madrid in 1849, or the work of Francisco J Orellana, the author of El Conde de España o la inquisición military (The Count of Spain or the military inquisition), published in Madrid in 1856. Letamendi’s book is influential, and many of the authors who wrote about the adventures of this Comerford countess drew on his semi-fictional book for their information, uncritically including its many errors. The details of her family origins and her guerrilla activities were copied from one book to another, reproducing silly details and many inaccuracies. Cristóbal de Castro’s novel The English woman and the Trappist (1926) is misleading even in its title describing her as ‘the English woman.’ He rescues Josefina de Comerford as a heroine in his short, 60-page novel, in which she is portrayed as a beautiful and enigmatic woman who was known as la dama azul.